Clive was born in Acornhoek on the 12th of January 1979. He spent his pre-school years on the Kapama Game Reserve, where both is parents worked. At the age of six young Isaac started school, going first to Timbavati Primary and then to Magwagwaza High School in Acornhoek. He proved to be a quick study, impressing his teachers and classmates with his eagerness to learn. During the school holidays Isaac worked as a general laborer for pocket money. Upon finishing school he was offered a permanent maintenance position on the reserve where his parents still worked. And then in January of 2003, construction began on Camp Jabulani and Isaac was part of the building team. Once the Camp was completed he was offered permanent employment as a gardener. Isaac worked hard in his new position, while at the same time harbouring dreams of one day becoming a butler at the Camp. After two years management felt that Isaac had more than proved his worth, and offered him the opportunity to fulfil his dream. Isaac continued to work as a gardener during the day, but at night he trained to become a butler. Not only did he have to contend with the long hours, but he also had to overcome another obstacle. Isaac couldn’t speak English very well. In three short years this young man proved just how determined he was to reach his goal. Not only did he realise his dream of becoming a butler, he became one of the best in the business. He also mastered the English language, and then went on to become fluent in three more. He now speaks a total of five languages. 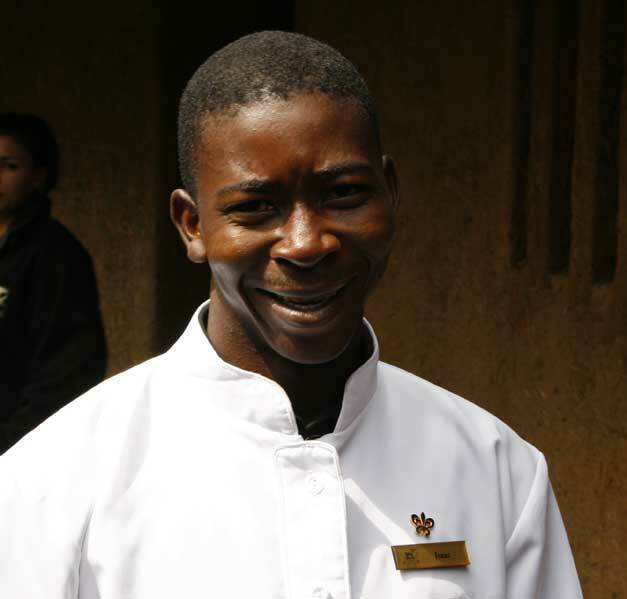 Isaac quickly moved up through the ranks, and he is now Head Butler here at Camp Jabulani. He is also in charge of training the new staff. In his spare time Isaac likes to watch football and is an avid Kaizer Chiefs supporter. Isaac’s idol and role model is Nelson Mandela, and his new dream is to become Assistant Manager at Camp Jabulani one day. And given his current track record, we have no doubt whatsoever that he’ll achieve this. We were fortunate to have met Isaac while on vacation at Camp Jabulani. I would have to agree totally with the writing above. He is definitely a hard worker and it would not surprise me in the least to find Isaac as Assistant Manager at Camp Jabulani some day soon. Keep up the great work, Isaac and don’t lose that wonderful smile of yours!